Like many other youngsters, I started playing tape-ball cricket around my home in Pir Mahal and then progressed to hard-ball cricket when I began playing for my school. My teachers in the school saw my talent and recommended to my family that I be sent to a bigger city like Lahore to play club cricket there and pursue the game at a higher level. My family agreed to this move and for that, I am forever indebted to my parents and my siblings for their constant encouragement and support. I would like to mention my elder brother Kamran Sabir for his guidance throughout my career and his invaluable help. With all this support, I was able to start playing club cricket in Lahore in 2012 for the P&T Gymkhana Cricket Club. 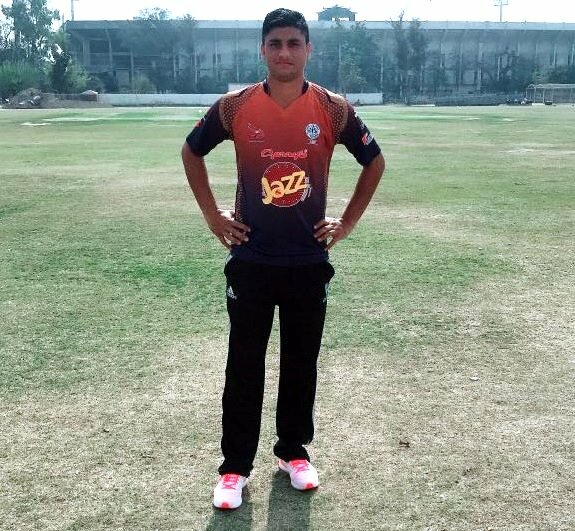 I did not have the luxury of participating in Under-16 level cricket and so based on my club performances I moved straight to the Under-19 level where in the two-day Inter-District Under-19 Tournament in 2014, I played 5 matches and scored 305 runs which included a hundred and two fifties for my team, Lahore West Zone Whites Under-19s. I did not have satisfactory performances in the following Inter-Regions Under-19s One-Day Tournament 2014/15 and the three-day Inter-Regions Under-19s Tournament 2014/15. So, 2014/15 were my first years of playing real competitive cricket but I could not perform as well as I wanted to. In the years that I was eligible to play for Pakistan Under-19s, I could not perform that well so that is one aspect of my career which is a little disappointing. I was not offered a chance to play first-class cricket by Lahore in 2015/16 so I busied myself with trying to improve my game and putting all disappointments behind me and my hard-work paid off. In my debut game in the three-day Inter-District Senior Tournament 2015, I scored a hundred, and in the four matches I played in this competition, I scored 291 runs for Lahore West Zone Whites. In the following year, I again performed well in this tournament, making 269 runs in just two matches. Shortly after that, I also played in the three-day Patron's Trophy (Grade II) 2016/17 tournament where in 6 matches, I amassed 632 runs with 1 hundred and 5 fifties and was top-scorer in the tournament. This was a like a dream come true for me and it seems that the Almighty rewarded me for my hard-work when I finally got to debut in first-class cricket. Not only did I finally play at the highest-level domestic competition in Pakistan, I also scored a hundred on my debut. This innings was greatly appreciated by all my seniors and what really pleased me was that this innings was played against a team which boasted some of Pakistan’s top bowlers such as Mohammad Abbas and Sadaf Hussain. I got to play 3 matches in total in that season and scored 212 runs which for a first season was a satisfactory result. It’s been a great few years for me in both first-class and Grade II level cricket in 2017/18 where in the three-day Patron's Trophy (Grade II) 2017/18 tournament, I played 6 matches in which I scored 416 runs with 1 hundred and 2 fifties for State Bank of Pakistan. During this time, I also took part in the Pakistan Cup One-Day tournament where in 2 matches I had 75 runs which included one fifty, for my side Balochistan. In the Quaid-e-Azam Trophy 2017/18, I continued to show my skills with 497 runs in 8 matches to become the top scorer for my side, Lahore Whites. Here, I hit one hundred and 4 fifties and really demonstrated my suitability for the longer format of the game, which is something I would like to play for Pakistan as well in the future. The recently concluded Quaid-e-Azam Trophy 2018/19 saw me play another 8 matches, scoring 421 runs with 3 fifties for Lahore Blues. The only player I admire and want to emulate is the former Sri Lanka batsman Kumar Sangakkara. I have watched his videos and noted how he practices and have studied his batting style in great detail. However, I have also been told that my batting style is very similar to Sharjeel Khan as well which is a great compliment for me and especially now that I have been picked for Islamabad United, I hope I will get a chance to play and perform like Sharjeel. In terms of shots that I prefer to play, I love to drive the fast-bowlers and to take on spinners and hit them straight. Whenever I bat, I always plan to allow myself time to settle in and then go for my shots as needed by the team which is what I did recently during the National T20 Cup when I hit 72 against Islamabad for my team Lahore Blues. My selection for the PSL came out of the blue and frankly I wasn’t expecting it all, but I am indebted to the Islamabad United management for giving me an opportunity to be part of their PSL squad for the 2019 season. Playing in this tournament is every young cricketer’s dream as it gives so much exposure and can open many doors for you in terms of your career development. I am also really looking forward to working with some of the top Twenty20 players such as Luke Ronchi so that I can learn and improve my game at the PSL. A chance to play for Pakistan is what any young cricketer wants, and I am no different. I feel that I have the skills to play in all formats of the game but I would specially love to play Test cricket for my country. Last edited by Abdullah719; 20th December 2018 at 11:29. Strong boy. Can't wait to see his development. looks good. I hope he'll work hard for his selection at international level. If he has a strong PSL, assuming he gets games, then I wouldn't be surprised if he gets selected for the WC. He could possibly bring that mystery factor similar to Fakhar in CT17. Mixture of sharjeel, Fakhar & Sangakara. So far he is very impressive, pcb should take good care of him as he has the potential to succeed at higher level. Forget about Sahibzada, try this guy. Looking forward to see him develop a cover drive against Fast bowlers since his role model is Sangakara and he watches alot of his videos to learn batting. Next step is developing his game against quick short pitch bowling and increasing his shot range between point and mid off especially of the front foot by getting in line of the ball. He is a good find. Now he has got much needed exposure and it's all about developing your game for the next level. In Pakistan there is nothing such as development as the cricketers do not aspire to improve themselves as over the years we have seen the so called "seniors" make the same mistakes despite playing for 15-20 years. The youngsters do not aspire to play proper cricket as it is all about T20 cricket and playing across the line shots mostly, their appetite for runs is not there at all. Meanwhile, Rizwan aspires to bat like Sangakkara, wants to play Test cricket in particular and plays a lot of aesthetically pleasing strokes through the line. He's shown serious consistency for an aggressive young Pakistani batsman in this tournament. Yet again, he's batting on 40+ against FATA. You can't deny the fact that what I said does happen quite frequently where these guys initially start well but then it is business as usual. Aspiring to bat like Sanga and yet not able to develop a cover drive against fast bowling at the age of 22, it does point out that something somewhere is not right. You are being harsh. He possesses a lot of quality strokes and it's unfair and premature to say he's a hack or limited against pace. He deserves credit as he is currently the leading run scorer in the tournament right now. If this cup holds any value then he should be in pakistan's t20i squad for the sa tour. He'll have to do well in the PSL first. That's how it works these days. The only bright spot in the worst T20 tournament in history of T20s in Pakistan. Hope Islamabad United gives him consistent opportunities in PSL. He is competing with nepotism stalwarts like Imam and Shan Masood. @Deewana Mastana, nice cover drive against a pacer at 1:26. Consistently good in the National T20. Looks like a batsman with a wide range of shots and a batsman who has power and also skill. Sweet, sweet timer of the ball and in that little clip I can see his placings are better than some of PAK's regular, can hit off the back foot as well. Obviously different level, but I have seen Azhar scoring lots of runs in PAK Cup - hardly any timing or placement. Need to be fast tracked into PAK set-up like Babar, otherwise in couple of years time he might be lost!!!! If he gets 2,3 games here and there, i m sure he vl make his mark to the international level, he is good at driving the ball and play straight to the spinners which is a good thing to do,he is not an onside hack like sharjeel in his early days and awais zia, bright prospect for the future. He is really talented. Looks to play ball on merit and with timing all around the ground. Been superb and consistent this tournament. If he carries on doing good in the torurnament then he should be in the squad for the South Africa series! If that's too soon, then let him play PSL before getting an international call up but this guy looks very good! Yes it's too soon. It's his first consistent performance at domestic level. Hmm maybe, but if he has a good PSL then definitely should be considered for T20's. Probably too soon for ODI's though, would be unfair to give a young guy an opportunity just before the WC. I still think he could be considered for the SA T20I series, even if he's just on the bench it will be a great experience for him. He has to be given chance in PSL. If he performs then he should be brought in the T20I side just like everyone else. The more I see him, the more i like him. Get him in asap. I mean he has all the right ingredients but I'd like to see him perform over a longer period before he is inducted. We shouldn't forget that folks like Nauman Anwar and Shahibzada Farhan have had even more spectacular one-off tournaments in the past and have struggled to even hold a bat since then. It is a dangerous proposition to start inducting people in the national side on the back of performances in one low grade tournament. Much better than tullars and ordinary players like Awais Zia, Sahibzada Farhan, Mukhtar Ahmed etc. Kids looks like a proper player. Has the build of a fast bowler. Yes 6 foot 1" and uses his height well in his strokeplay. Really would like a good batsman to emerge - we have so many bowlers but hardly here of young batting talent. Rizwan Hussain first caught my attention in when, from complete obscurity, he quietly climbed the charts in the QeA trophy (FC) last season after scoring on very difficult wickets. He ended up scoring around 500 runs (tenth highest) in eight games with four fifties and one century at a strike rate of 61. IIRC the only reason he didn’t finish higher was because he was playing for such a weak region. Unfortunately no one had any info or footage on him at that time. The first chance to watch him in a televised game came during the recent Pakistan Cup (April/May 2018). I had hoped he would play the whole tournament but Ahmed Shahzad only played him in two games. Rizwan’s first innings in the tournament was 67 (71) on a very flat wicket (his side chased 372!). Initial thoughts at that time were Rizwan was composed and his game was mainly based on rotating the strike and accumulating runs, with the occasional bit of aggression when it was in his zone. He has played well in the ongoing National T20 Cup (the first time he has had the chance to show off his T20 game) which in some sense vindicates his selection by IU for PSL4. i.	Rizwan has excellent timing (bat swing is golf like). His batting is a blend of mechanical and easy on the eye. Rizwan has good wrists and his modus operandi is to rotate the strike by dropping the ball/playing the ball through midwicket. He does this even if it is bowled on a fifth/sixth stump line which can get him into trouble (I come back to this later). ii. His stance and trigger movement, especially against pacers, reminds me of Cook (watch his complete innings, not just highlights and you will see what I mean). Like Cook he is strong off his legs and square of the wicket, particularly on the offside, and he cuts anything a tad short. Unlike Cook, he actually has a power game. There is a lazy elegance to some of Rizwan’s shots; he hits through the line beautifully and his hitting area is in the V, especially between wide mid-on and straight down the ground. iii. He is very confident against spin and sweeps well. To date, he has played pace okay but the pitches he has played on have been pretty slow (lifeless in the case of the Pakistan Cup) so too early to judge his game against pace. i. He favours the onside. The one time he tried playing a drive in his 67 in the Pakistan Cup he was bowled by Hammad Azam. His innings in the T20 Cup show he can drive through the offside but he nevertheless needs to work on aspects of his offside game, particularly (i) when it comes to rotating the strike and (ii) against pacers. He seems to be particularly limited when it comes to hitting it through cover/extra cover (yet that is where sides are putting their fields!) The few times bowlers have got it right to him, Rizwan has ended up getting frustrated and swiping across the line. ii. Has looked uncomfortable against the short ball at times. iii. Rizwan’s defence is a little loose at times and at times he plays away from the body. This was a surprise given how good a FC season he had last season on some very difficult tracks. It’s not a huge issue in white ball cricket but something for him to work on in red ball cricket. He is obviously talented and he has played well in the T20 Cup, but he has been helped in his recent performances by the fact opposition sides haven’t done their homework and bowled to his strengths and set the wrong fields (can write more on this if people want me to). The true test will be how he fares against sides who actually do their homework and set the right fields/bowl in the right areas. Also want to see him play on better wickets (particularly to assess his game against pace). In other words, good going but he is yet to be properly tested. a. Opposition sides should have a midwicket and square leg for RH to cut off the singles and put him under pressure. They should also put boundary riders at deep midwicket/cow corner and straight hit. Mid-off needs to be tight to Rizwan; teams have tended to put mid-on wide to RH which suggests they haven’t done their homework. Just look at his 58 vs Multan and you will see there were a couple of boundaries where he would have been dismissed had they set the right field. Leave cover open and try and get him to hit it through there. He is brutal square of the wicket on the offside so be sure to have a point. b.	Bowlers seem to lack plans against Rizwan in the T20 Cup, with the exception of Aamer Yamin who has angled it across off stump/outside off stump on a back of a length/good length. That is exactly what you need to do; Rizwan’s feet end up getting stuck and he reaches for the ball. Rizwan ended up getting frustrated, swiped across the line and was bowled. It’s not rocket science but no one else seems to have got the memo. That said, in the Pakistan Cup Irfan Jnr (windmill) got it right a few times and bowled that awkward length angling across Rizwan, but the problem was Irfan Jnr insisted on releasing all the pressure by bowling to Rizwan’s strength at least once an over. Better bowlers won’t let RH off so easily. c.	In the Pakistan Cup, Zia and Sadaf showed exactly how left arm seamers should bowl to Rizwan; come over the wicket and bowl back of a length/good length on any line outside off stump and he will struggle to rotate the strike. But bowlers have tended to bowl on his pads which is bowling to his strength! Irfan (7’1”) is the only left arm seamer who has tied Rizwan down in the T20 Cup. o	Brutal on anything he can cut through point/backward point, but feet stuck so sometimes misses out with his hand coming off the bat. o	Usama Mir bowled well to him and the keeper even dropped RH, so interested to see more of his game against legspinner. o	Looked comfortable hitting overpitched deliveries through offside, but issue (particularly against pacers) when pitched on offside re rotating strike. These dot balls explain his poor list A record. In that match he got frustrated, skied one but fortunately landed safely. Right hand coming off his bat in last two innings. Has happened a few times. Tries to move around too much in his crease at times. o	Imran snr and Waqas bowled beautifully to him. Was going nowhere. 4 (7) frustrated. Hands came off. Dismissed trying to slog it. His PSL dismissal in game 1 was very similar. As mentioned above, want to see more of his game against genuine pace. All in all, really excited to see his development. Extra bounce but a nothing shot today. Struggling so far. Not finding any fluency... hits a couple of good shots, but gets bogged down and eventually perishes. I think he struggles against pace. I mentioned this in my above analysis. Domestic teams seem incapable of reviewing footage and working out where to bowl to players which is why players often get found out at higher level (at least initially). Though he needs to improve some areas of his game but his skillset isn't completely handicapped so he can compensate. Today his drive through the offside proved that he is working on his weaknesses and isn't a one trick pony. It was a quality four. He missed a quicker one (seam up) arm ball from Nawaz today. Got beaten for Pace. Islu need to keep faith in him and Rizwan should spend sometime on the crease to get back his confidence and be among the runs again. Though he has few weaknesses on which it seems he has been working but those haven't been his downfall or mode of dismissal in PSL uptil now. Needs to further develop his offside play against Pace nonetheless but it would be unjust to say that He is average against Pace as in National T20 Cup he mainly scored against Pacers. All his big shots were against spin. United should back this kid since Nasir Nawaz is probably out of the tournament. Dean Jones should give him a bat and tell him to make it talk. In one of Youtube videos he was unable to execute a whack pull shot against Umaid Asif however he was fortunate enough to be dropped. Should improve balance, align his front and back foot in stance and trust his ability to pick up length.